Are foreign companies ready to invest in Ukraine, given the military conflict in the east of the country? 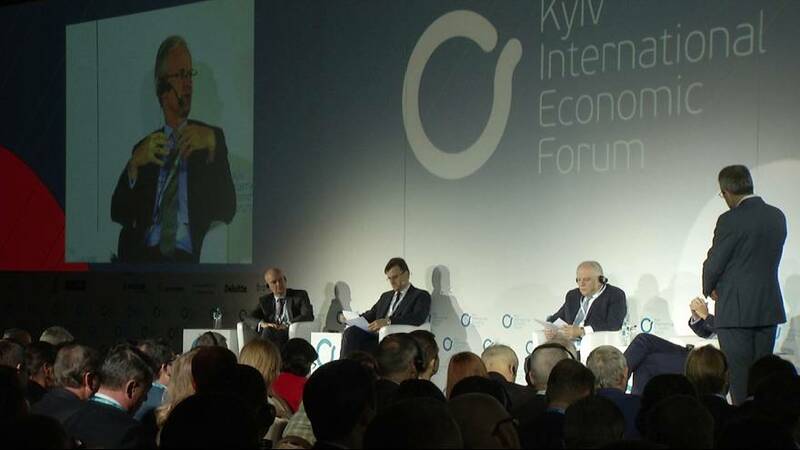 That has been a key topic up for discussion at the Kyiv International Economic Forum – which welcomed hundreds of economists, politicians and business officials from over 20 states. During the event’s opening, Ukraine’s prime minister said the priority is to phase out dependency on international loans and for the country to start generating its own funds – mainly by attracting investment from abroad. “Ukraine has received 2.8 billion dollars in foreign investment for the first six months of 2016. This volume is two times higher than in 2015. However, I’d like to emphasise that Ukraine could have received much more,” said Volodymyr Hroisman. Statistics confirm that current inflows of foreign investment are insufficient. Investment volume per capita is five times less than in Poland and ten times lower than Estonia, according to Ukraine’s Business Ombudsman. They were the results of research carried out by Dragon Capital investment bank and the European Business Association. More than 100 respondents were surveyed – those who plan to invest in Ukraine. “The three largest obstacles for foreign investors were obvious (clear). However, the fact that corruption won by a wide margin was bad news for me,” commented Eugene Baranov, Managing Director of Dragon Capital. Business officials want to see the Ukrainian government overhaul the judiciary, vetting existing members and hiring new judges. They also want prosecutions of high-level officials and judges suspected of corruption. “Corruption is an obstacle to investment in practically any country where it is rife and so the Council of Europe is supporting a lot of countries. In Ukraine, we work with the prevention agency,” said Tilman Hoppe, from the Council of Europe. Those attending the Kyiv International Economic Forum agree that if the Ukrainian government implements reforms, the country can become an attractive place for foreign countries to bring business. “Ukraine is a country of the greatest potential in Europe. Right now, it’s one of the cheapest labour (markets) in this part of the world. Hourly Wages in Ukraine are 50 percent of hourly wages in China,” said Krzysztof Siedlecki, President of the European Business Association (EBA) Board. To create conditions for attracting investment in Ukraine, the country’s government is launching the Investment Support Agency. It is due to start operating in mid October. It is a move that is welcomed, but forum participants say changes in legislation are vital too, to protect investors. All of the recommendations from the event are being passed on to the Ukrainian government. Ukraine: "the potential is exceptional"